Wearing gardening gloves, identify weeds and begin clearing the area by pulling out weeds from the roots. 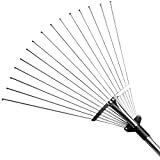 Use a rake to clear larger areas of brush. If there are plants which can be transplanted, use a border spade or transplant spade to dig down around the roots. Dig an outline around the root ball, position the blade under the root ball, and remove it from the ground. Place the plant on a tarp until you’re ready to replant it. Leave any perennial plants that can be salvaged in their current location. With the area clear and down to the soil, lay down stepping stones. Dig down a bit to ensure the stones lay flat on the soil and backfill as needed to prevent wobbling. To create a makeshift trellis, put nails into a fence and tie a piece of string along the nails. Attach climbing vine plants along the string. While still in pots, stage the plants, keeping those with similar needs together. Consider bloom sequences so that there is year-round interest throughout the entire design. Remove plants from their plastic canisters by tapping them out from the bottom. Gently tease out the roots from the root ball using hands or a hand rake. Dig holes twice as wide as the root ball, but not quite as deep. The top of the root ball should be even with the soil line. Place plants in the holes and backfill with soil and compost mix. Use the same technique to transplant any salvaged plants. If planting new bulbs, dig a hole using a hand trowel a few inches down. Place the bulb in the ground and backfill with soil. When all the plants are in the ground, cover with two inches of mulch using a rake. Be sure not to cover up the stems with the mulch. This will suffocate the plant. Water thoroughly until the plants are established.